You will free up your oven on Thanksgiving when you cook your turkey breast AND gravy in the pressure cooker! And the best part is that you won't be waiting hours on end for the turkey for cook in the oven. From start to finish, this recipe is ready for the table in less than 1 hour! The turkey is perfectly moist and the gravy is so flavorful. The best part is that it's all made in one pot! Rub salt, rosemary, pepper, lemon zest, and garlic all over turkey breast. Allow breast to come to room temperature before cooking. Turn on Sauté mode of pressure cooker on Normal mode. When it reads HOT, add oil. Sear turkey breast on all sides until golden brown, 3 to 4 minutes per side. Press Cancel. Transfer turkey to a holding plate. Add stock, carrot, celery, and onion to the pressure cooker and use a wooden spoon to scrape up any browned bits that are stuck to the pot. Place trivet over stock mixture, and place turkey breast on the trivet. Transfer turkey to a holding plate and remove trivet. Stir cornstarch and water together in a bowl until no lumps remain. Press Sauté button on Normal and bring mixture to a boil. Blend vegetables and stock in the pressure cooker using an immersion blender until smooth. Add cornstarch mixture and cook, whisking occasionally, until gravy thickens, 4 to 5 minutes. It will continue to thicken as it cools. Season gravy with salt and pepper to taste. Before you begin, make sure you know exactly how much your turkey breast weighs. Multiply that weight by 8 to get the exact number of minutes that you will pressure cook your turkey breast. For instance, a 3 pound turkey breast would cook for 24 minutes (3 pounds x 8 minutes = 24 minutes for cook time). Goes perfect with our Pressure Cooker Cranberry Sauce! Per Serving: 385 calories; 7g fat; 6.2g carbohydrates; 70g protein; 183mg cholesterol; 583mg sodium. 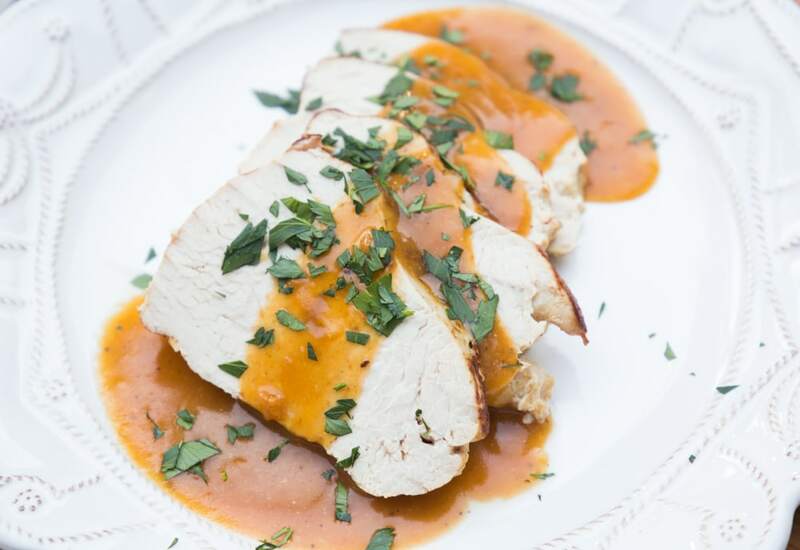 Delicious turkey breast and gravy! I am a fairly newer pressure cooker user but this recipe was not intimidating at all. It heats up quickly, which makes searing the turkey fast and simple. The best part is being able to put the lid on and walk away. This was also my first time trying a vegetable gravy and it was surprisingly delicious. The kids ate it, not even realizing it was made with vegetables. I made my own gravy but the turkey breast was nice and juicy. Sometime turkey breast can be a bit dry, but all in all this recipe came out really good, even better than expected.